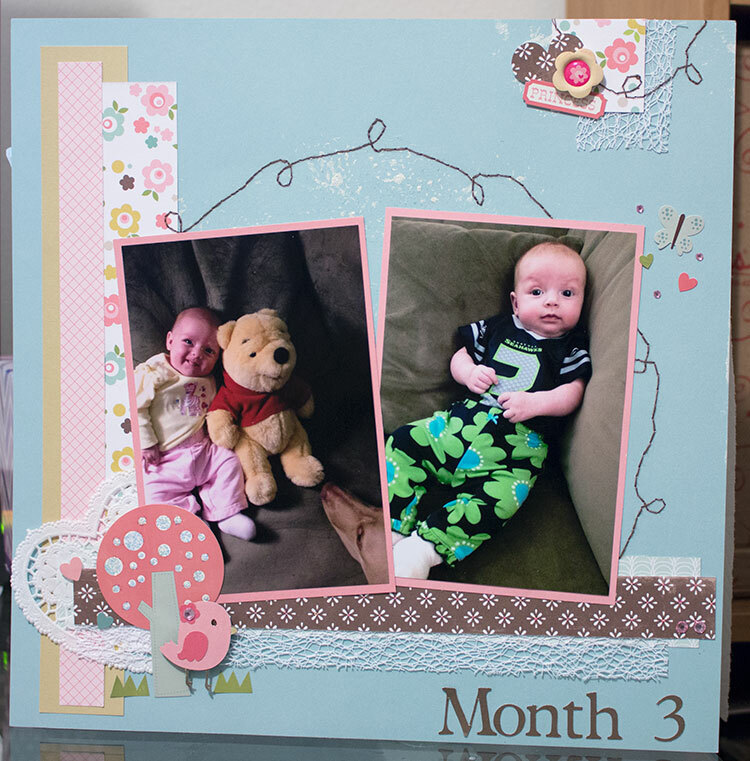 Accessories: Recollection Adhesive Rhinestones, Stickles, Heidi Swapp Banner, and Art Chix Studio wood cloud. This is another super simple layout, but, it helped me get started. I really love it though, but, I think it has more to do with the super sweet picture than anything! 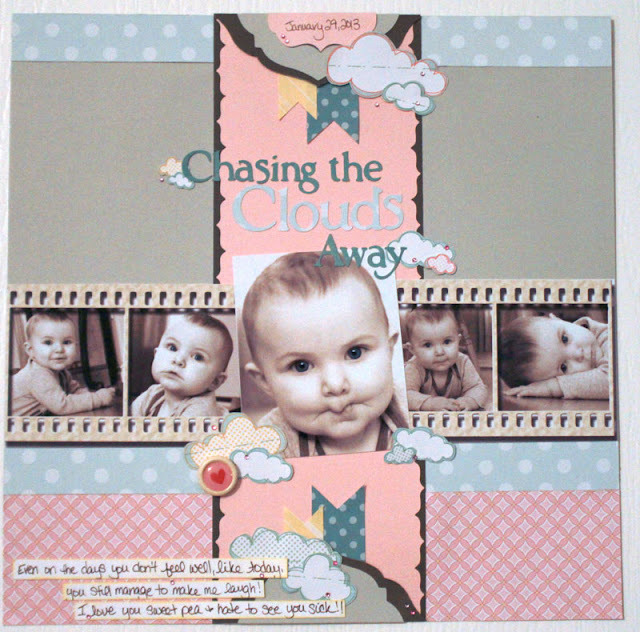 I copied the layout almost exactly from the cover of Close to My Heart's Summer 2010 Idea Book. They used the Cherry-O paper pack, it was super cute! Accessories: Stitch'z Bazzil Floss, CTMH paper flower, Martha Stewart border punch, Icicles Stickles, CTMH ribbon and chipboard flowers. So, as I mentioned in an earlier post, I'm trying to put together a baby book for my beautiful niece Lizzy. I'm ridiculously behind the eight-ball as she's already a year and a half old, but, sadly, I'm further along for her than my own kids!! Please excuse the poor lighting, but, there's not a lot of natural light to be had lately with all of our snowfall so that makes for a lot of adjusting!! 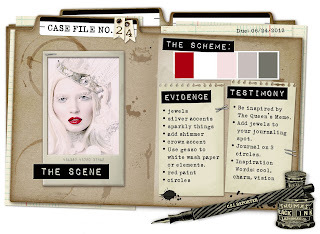 I used the "Backstage" layout template in Close to My Heart's Magic book to get me going. 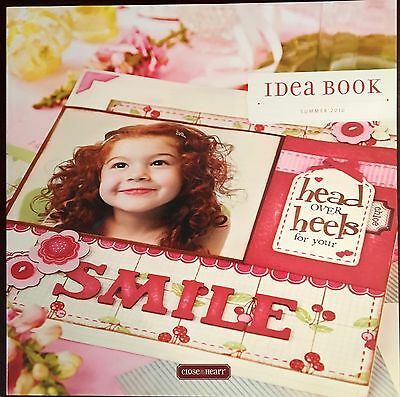 I was really struggling to get my scrapbooking mojo back and the templates in the book are a great way to get started!! Accessories: CTMH and Recollection Adhesive Rhinestones, Stitch'z Bazzil Floss, CTMH paper flower, Martha Stewart flower punch, Icicles Stickles, Fiskars Border Punch, and (title is done with stickers that came with the paper pack). So, completing two layouts in one month is probably not all that impressive for most, but, kind of a big deal for me considering my long hiatus!! Although, I've actually scrapped more than you might think, just didn't post. Anyway, this layout was so much fun and went together so fast, that never happens for me! I combined several challenges for this one which I hope is o.k.! First and foremost, the sketch came from Let's Get Sketchy. 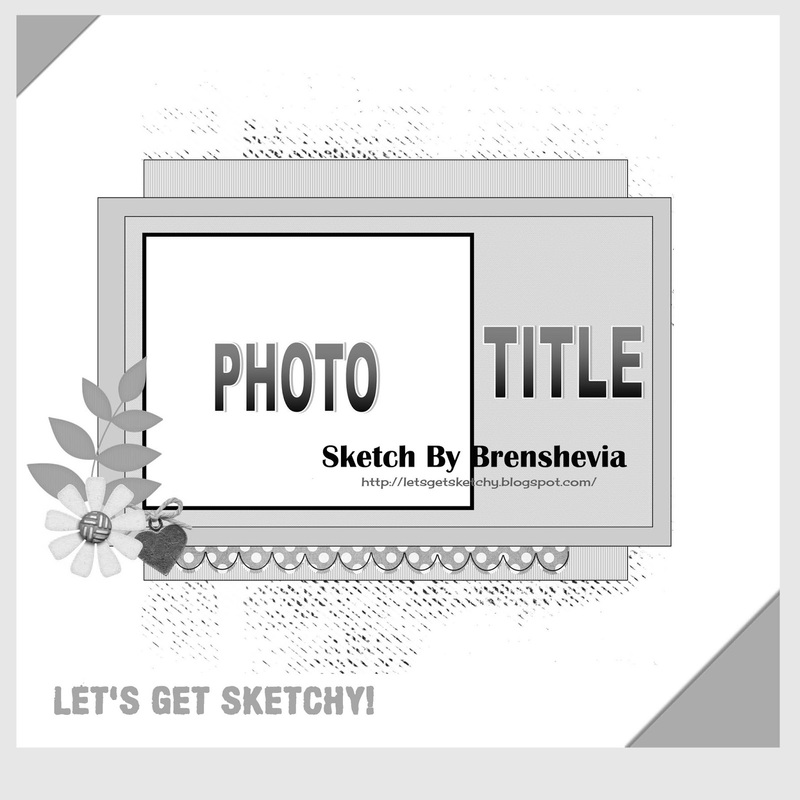 Such a fun site and they do a new sketch challenge weekly, so amazing and so much great inspiration on their blog!! 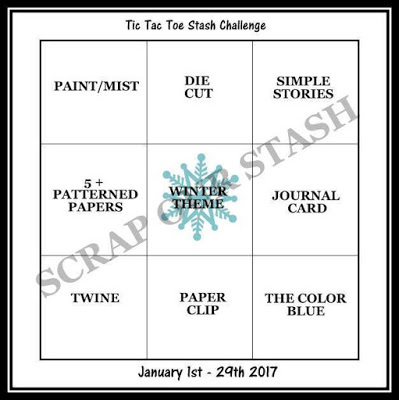 The second challenge that I used for inspiration was the Tic Tac Toe Stash Challenge from Scrap Our Stash. 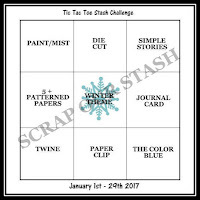 For their challenge you had to dig through your stash and use three items in a line from their tic-tac-toe board. 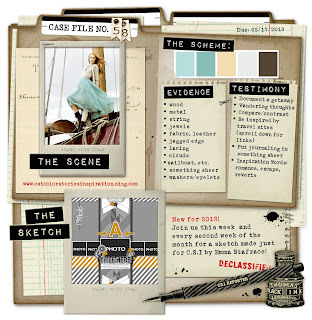 This challenge blog is new to me, but, I LOVE it because I have SO much stuff to use and they encourage you to add more to your layouts...I may not have been a prolific scrapper during my time away from my blog, but, I was definitely still a good shopper! 😜 I chose Paint/Mist, Winter Theme, and The Color Blue. I've had this picture of my son and pup for a year now and just think it's too cute. Max is getting older and not doing well, Owen will be devastated when we have to say goodbye, they've been inseparable since the day we brought Owen home from the hospital. 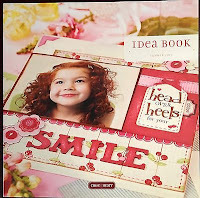 The final challenge that I came across when looking for new inspiration was on the scrapbook.com challenge forums. 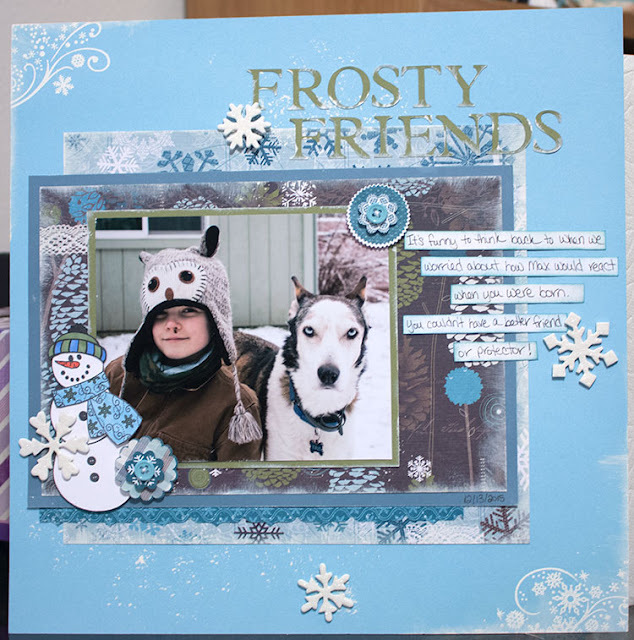 MarciLB challenged us to scrap a pet using a winter theme....I live in Alaska and have plenty of pets, so, maybe not much of a "challenge" after all, haha!! The forum has quite a few challenges and I am looking forward to playing along with more soon! Accessories: Paint and Dauber from CTMH distressing kit, Memento Ink in Tuxedo Black, Comic Markers, Versa Mark and CTMH embossing powder, Fiskars border punch, Maya Road Mini Chipboard Snowflakes, Martha Stewart Glitter (used on snow flakes...hard to see in pic), Plantin Schoolbook Cricut Cartridge, and Zig pen. I cannot believe it's been SO long since I last posted. I think having a little princess in the house was kind of my crafty undoing, I don't get the "alone" time I had before with just a boy in the house!! She's my constant companion and NEVER stops talking!! 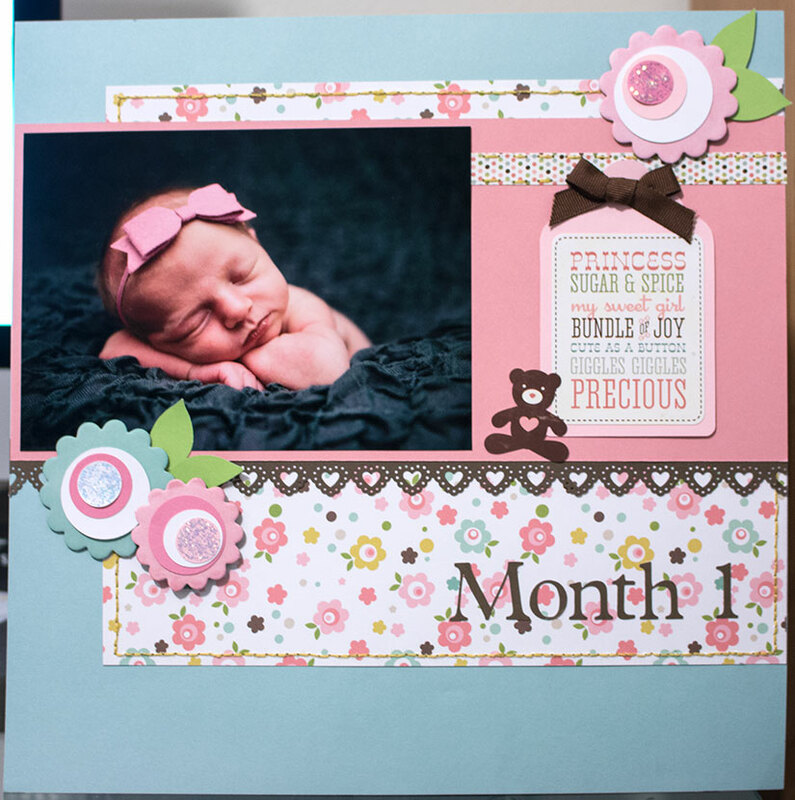 😊 But, I can't blame her for it all, I've been struggling with back issues since she was born and would rather lay down and take a nap than sit to scrapbook or post a layout on the blog. Fortunately, I think, I finally have had someone take a closer look with xrays/MRI and determined I have three tears in my lumbar disks...turns out I'm not just a whiner! I'm currently working with a chiropractor that seems to be helping. I've gotten actual quality sleep the past couple weeks!! It's amazing what a difference being rested does for your entire life, I'm SO thankful and hopefully, will be on here more often. Anyway, enough about me! After being away for so long, I realized, most of the challenge blogs I used to follow have called it quits. So, I went on a search for some new ones!! I'm trying to do a baby book for my sister's now 18 month old...nothing like being behind!! So, I was especially looking for layout challenges. I've always loved the Stuck?! sketches, but, this may be the first time I was able to play along and submit on time! I'm still trying to get back into it, it's amazing how hard it is to put a layout together when you haven't done it in forever. 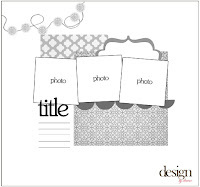 Scrapbooking is definitely a skill that takes practice to make it look good like the design team on Stuck?!. I had hoped to participate in the second challenge this month too, but, thats not going to happen this time!! I had fun with this one though! Accessories: Fruit Punch and Icicles Stickles, Wilton Heart Doilies, Recollection Adhesive Rhinestones, Stitch'z Bazzil Floss in Geneva Brown and stitch guide, Recollections Embellishment-flower button (that's really all the packaging says), paint/brush from CTMH distress kit, and lace by the yard from local scrabpbook store (no brand available). 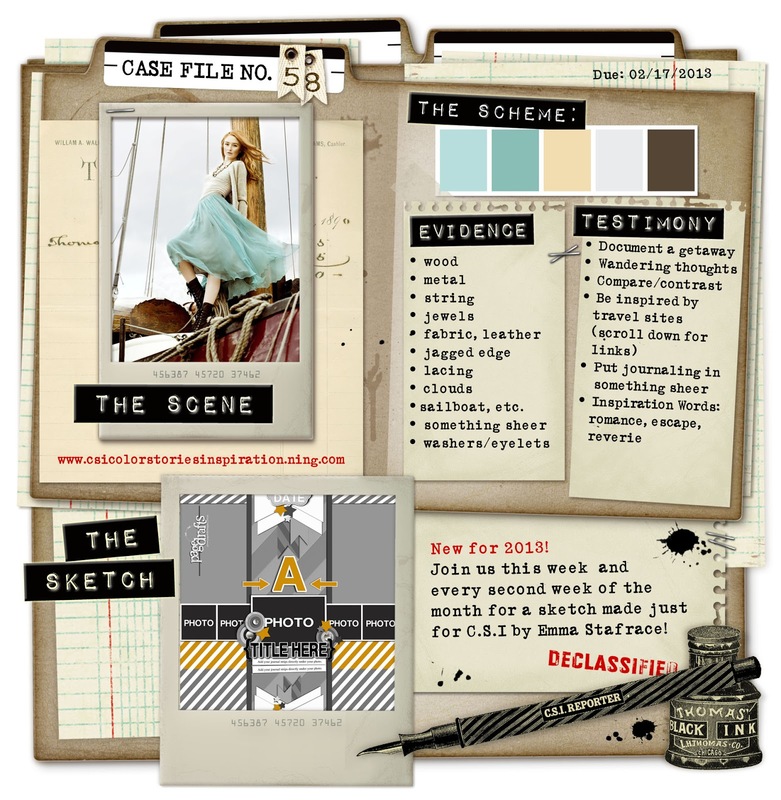 I was SO excited about this week's CSI "Case" (Case #58), especially since this was the monthly challenge with the sketch from Page Drafts tied to it and the colors were totally geared to earth tones. But, when I actually got started, I really struggled!! I ended up adding a LOT of pink which is REALLY not like me!! Anyway, how could I lose with these shots of Olivia! ;O) I found a tutorial online at tipsquirrel.com by Photo Gavin and was able to make my own film strip...complete with texture, color of my choice, and a drop shadow...not to shabby eh? ;O) This layout really came down to the wire for the CSI deadline, so, it got rushed. But, I actually really like it even though I'd probably have done some things differently given some extra time. I can't believe it! I was mentioned under "On the Watch List" at CSI for my "Baby Face" layout, so incredibly honored!! ;O) Lots of talent over there, can't believe mine was even noticed! Thought I'd share the other layout I managed to finish over the past couple of weeks and since it was fitting for Valentine's Day...I've literally had this sitting on my scrap table since last June. Usually, when something sits there that long, I end up getting so sick of looking at it, I just throw some things on it to get it done. But, I love how this one turned out and didn't really agonize over it like normal. I used Case File #24 posted on 6/24 at the CSI blog for this one. Evidence used are jewels and silver accents and my Testimony was to add jewels to the journaling spot. 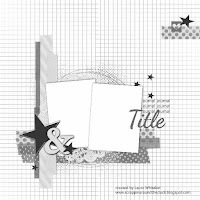 I'm so sad to say that this was my first and apparently last challenge with the Scrap Fit Blog as they have decided to end their challenges. 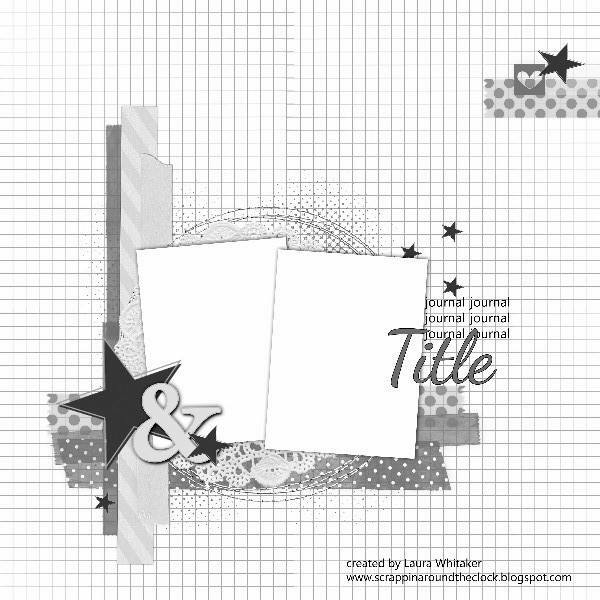 I didn't realize they'd decided to end the blog until today when I went to find "Workout #69", the sketch I had used from way back on June 1st to do the layout below. I'm so disappointed. 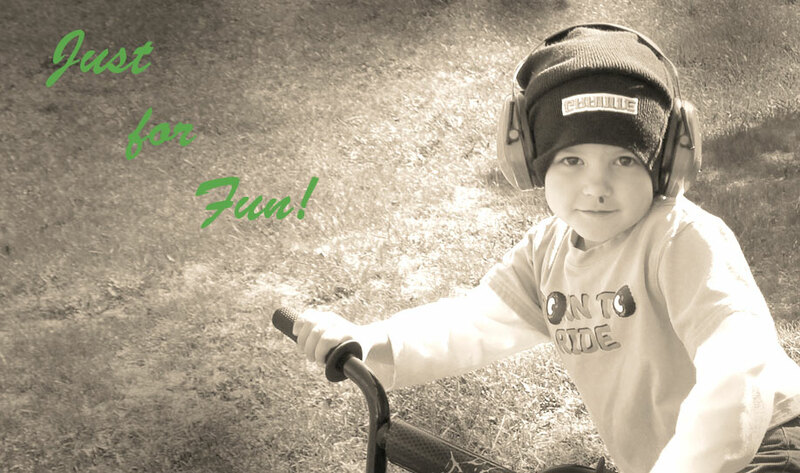 Obviously, I didn't get to participate much after finding the blog, but, I did really enjoy the variety of challenges they had each week and found it very inspirational. 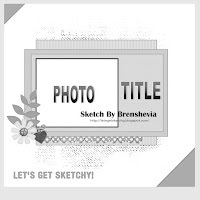 For example, I also incorporated "Workout #70" posted on June 15th to "Develop your Own Polarods"into this layout. I found the free polaroid picture frames online somewhere, but, it's been so long, I wouldn't be able to tell you where to give them credit. 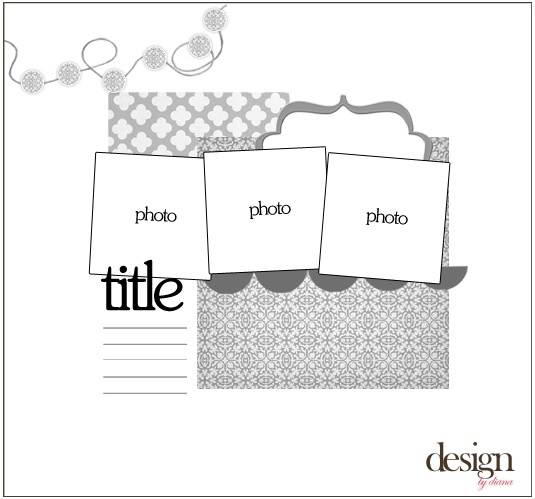 I think I also used a grunge frame from one of Jessica Sprague's online courses to give the photos more depth. Anyway, hope you are all enjoying what's left of your Valentine's Day! Dave, Owen, and I all have tomorrow off which would have been great, but, Owen's come up with a nasty flu bug! We'll be watching him and his sister very closely the next couple of days!! I'm a proud Alaskan raising my two amazing little ones up here with the help of the best husband ever! 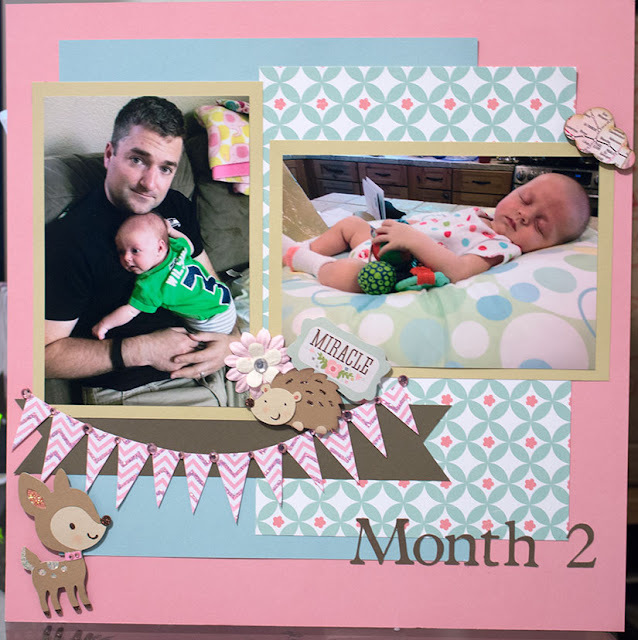 I love that scrapbooking allows me to record every wonderful memory that goes along with my photos so that the stories aren't forgotten. I was with Close To My Heart for over five years and because I was my own best customer, the products I use are theirs unless otherwise noted!